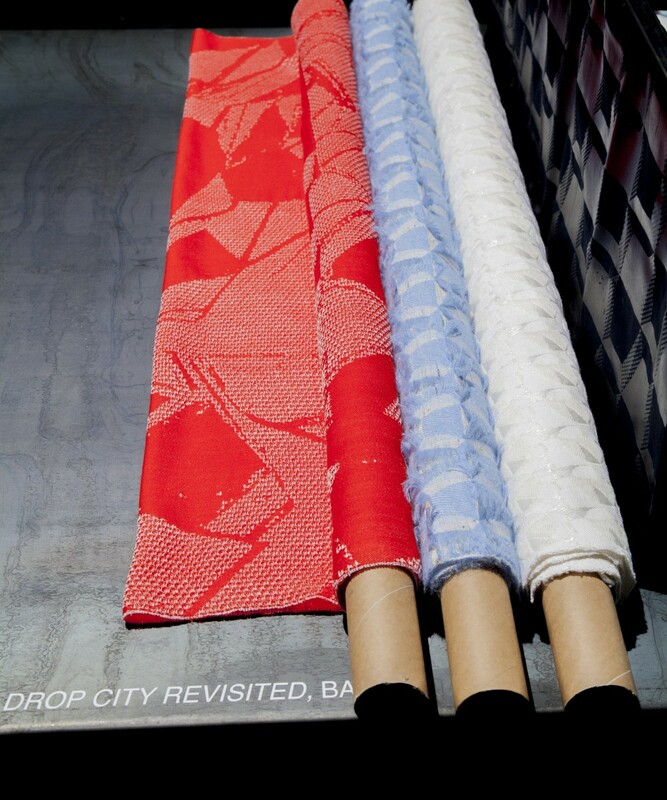 Miisa Lehto’s textile collection is inspired by theories of colour interactions, the Drop City and the Futurism art movement. This work examines the potential of textiles in demonstrating the different theories of colour mixing such as transparency effects and optical colour fusion techniques. Drop City, ‘the first hippie commune’ was an artist community in the 60’s with utopian leanings, influenced by the ideas and forms of Buckminster Fuller’s geodesic domes. As domes reflecting the fusion of colour, form and future were a main feature of this community, the Drop City plays a part as the thematic and visual centre of this exhibit. Miisa Lehdon tekstiilikokoelman lähtökohtana ovat teoriat värien vuorovaikutuksesta. Työ tutkii mahdollisuutta havainnollistaa eri väriteorioita tekstiilien avulla. Visuaalista inspiraatiota työlle ovat tarjonneet Drop City ja futurismi. Drop City oli 1960-luvun taiteilijakommuuni joka sai vaikutteita Buckminster Fullerin arkkitehtuurisista ideoista. Kommuunin rakentamat geometriset kupolit ilmentävät värejä, muotoa ja ajatusta tulevaisuudesta, ja Lehdon työ rakentuukin vahvasti Drop Cityn temaattisen kuvan ympärille.